Minow can now process short-codes. Well, it started doing so almost a month back… just that I never got time to update my blog. As of now, the short-code processor has been encapsulated in a simple interface that does the processing of a short-code with attributes. 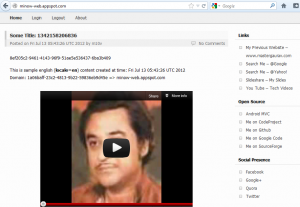 At http://minow-web.appspot.com/, you may notice YouTube videos embedded in the posts. They are not hard-coded HTML but processed using the YouTube short-code processor.